When a large, heavy and expensive lens in its third generation is elected by its manufacturer to launch a new series dedicated to sports, you’re talking about a top-notch component. And the Sigma 120-300 mm f2.8 is a unique piece for focal and brightness that no other manufacturer has dared to make. Its revamped zoom has already become an indispensable tool for professionals and an object of desire of many fans. A bit short for wildlife photography, too heavy and large for everyday photography. 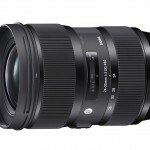 So where is the appeal of the Sigma 120-300 mm f2.8? In those scenes that require medium distances photographing in low light. The sports halls and scenes strike us as the natural habitat of this popular Sigma zoom, which has now reached its third generation. Its vast array of new features will surely make it a true classic among professional photographers. Armed with this bright bayonet Canon zoom (available also for the Sigma and Nikon mounts) and EOS 6D, we spent a few days testing it. This strong lens has an optical schematic of 23 elements arranged in 18 groups, 2 of which (FLD) are fluorite-coated coating and another (SLD) is low dispersion. It also features multi-layer coating designed to reduce glare. Like the previous model, the new Sigma is waterproof, dustproof, and incorporates a new plastic material called TSC (Thermally Stable Composite) that prevents contractions and dilations of the lens produced by temperature changes (which, we assume, ensures an optimal precision with the passage of time under any temperature). Both the ultrasonic focusing system -with improved algorithms, like the company stated- and the OS Optical Stabilizer with 4 steps are its main features. The stabilizer has two modes: one for conventional scenes and another (identified by the number 2) for moving objects. The lens doesn’t change size and the diaphragm, in turn, boasts 9 blades due to its perfectly circular hole. The set without the hood front measures about 30 inches (291 mm) and a diameter of 121.4 mm. It weighs 3725 grams, or just over 3 kilos, without support for tripods. Sigma offers an optional USB support compatible with its new range of objectives. Known as USB Dock, this accessory allows you –along with the free software- to configure many parameters about your camera. You can change – for example, the autofocus speed, the focusing distance limit or adjust the image stabilizer function. All this can be recorded and assigned to one of the buttons on the target (“C1”, "C2" and " OFF”) to ensure they work in different ways. Thus, the C1 can devote to scenes that need accuracy rather than speed, and the C2 to capture moving objects. This is certainly a very interesting accessory for a lens like this, since it can aid you to exploit its full potential. Sold separately, it has an approximate price of 60 dollars. Not unlike the latest releases from Sigma, quality construction, exterior maintenance and the “Made in Japan " label are the keys design-wise. All the details are taken care of: from the rubber back, which ensures maximum protection against water, to the impeccably-made brass bayonet. The inside of the lens is closed by a black-colored fixed lens that protects it from dust; it also has a robust and well-made tripod support. Waterproof and dust switches are flat and sliding-type, and they click at each position. The first, larger than the rest, can shift between manual or auto focus, although you can use the ring to manually operate the focus even when the position of this switch is set to automatic. The second is a focus limiter with three positions: full, 10 meters to infinity and minimum focus distance of 10 meters. Incidentally, this minimum focusing distance is 110 cm at the 120 and 200 mm focals, and 210 mm at the longest focal, as we have experienced in our tests. The two rims of the zoom are also excellent: they control the manual focus, continuous type, and the automatic focus system. Both are covered by rubber to give you an excellent grip, which makes operation lightning-quick. One detail that we have found while reviewing the EXIF ​​data of the photos taken with this lens: to match the exact focal painted marks (120, 150, 180, 200, 250 and 300 mm) you have to increase the zoom to its max values. It seriously needs a filter to protect the lens from dust, though; the frontal area now has some buttons which can be operated from the front or side. Finally, the standard sunshield accompanying the target is cylindrical with black-colored internal design to prevent reflections. The clamping mechanism is robust, but the protruding screws can get hooked easily to clothing or a backpack belts and cause unwanted accidents. Obviously, this shade can be mounted reversed to make it easier to carry around. Mounted over the effective Canon EOS 6D we have used in this test, the Sigma 120-300 mm f2.8 looks stunning, making the body look almost like a simple accessory located on its back. Without a tripod, the overall weight becomes supported by the left hand, leaving the right free for handling the camera. The autofocus is fast enough, but still improvable. The USB Dock can help to give this process a boost in speed. Whether a single focus point or multipoint option, in simple mode or photographing moving objects, it gives excellent results. But we must be clear about the configuration of all these elements to get the best result in every situation. In our tests, we photographed fast-moving objects and get excellent results. As for the image stabilization, it’s effective for static objects and even with the longest focals, we got great results. In any case, it’s not a bad idea to use this Sigma accompanied by a sturdy tripod or a monopod. Despite the good stabilization, their weight does not make it suitable for some lengthy sessions. As already mentioned, the short distance of the focus ring and zoom is very useful to reframe quickly. The tripod mount is alright, although we would have preferred a system that did not involve removing separate lenses each time, which would have been more comfortable, clean and fast. The hood, meanwhile, fulfills its function, although it’s rarely necessary, unless it’s raining. The general behavior falls short of what is expected of Sigma, even though we have not detected any aspect that stands out negatively. The camera does not "recognize” the lens, so it does not apply corrections of parameters like vignetting or distortion, and in this sense the resulting JPEG and RAW files are very similar. Speaking of vignetting, this would be the weakest aspect about this zoom. At f2.8 the darkening of the corners is evident at all focal lengths, but at 120 and 200 mm, it’s easy to fix it. Things get complicated at 300 mm, since this problem is visible even at f5.6 and greatly affects the final quality of the picture. As for the resolution, f2.8 gives excellent results, comparable to those of a fixed lens. In the end the result is good; the results suffer at 120 and 200 millimeters. The f8 would have been a more balanced choice in this regard. As for chromatic aberrations: you don’t have to worry about it. You’ll only slightly see them when taking pictures of really close objects, but they will almost always go completely unnoticed and you could even say that your pictures will mostly not require post processing. The diffraction doesn’t affect the quality even at f22, and the deformation is so small that it is hardly noticeable even in shots with parallel lines in the margins. Lighting a full-frame sensor with a zoom that boasts a constant aperture of F2.8 and a 120-300 mm focal is not easy. In fact, only Sigma seems to be up for the challenge. The counterpart, price aside, which stands at around 3,500 dollars, are a volume and weight that make it a good idea to leave the lens in the bag until the last moment before firing. The combination of all its features with its luminosity, like we said, makes it perfect for sports events. Without being spectacularly fast, the behavior of the autofocus is alright and fits perfectly with the servo mode of a camera like the EOS 6D, which is not designed for this type of job. Excellent reflection controls and a great stabilizer are also two of its features. Still, you should bear in mind that this camera is designed for medium and longer distances than for short. Perhaps with an extension you could try to do some macro photography. But that is not its purpose. We are facing a professional and very specialized camera. Even more so than in previous generations, if we consider that “S” denomination (Sport) it boasts now. The quality is indisputable both in performance and construction. Its only noticeable flaw is its vignetting performance and perhaps the excessive weight (nearly 4 kilos), not good news for most photographers. Its price may seem high. But since this is a unique piece and without competition, there seems to be much to debate about it. For those who are thinking there is no alternative, this is a great option which is worth the money.